Do you ever feel like you need a weekend to recover from your weekend? Because I sure do. I don't know when weekends began to feel so jammed, but between four performances of Love, Loss and What I Wore, working for a bit yesterday, holding auditions for the next show I'm directing, cleaning the house and exercising, I lost my weekend. Where did it go, and could I have it back please? The only time I managed to slow down was when I got home from the theatre yesterday. Free time--what's a girl to do? Why cook, of course. David was still hunkered in the living room watching the football game and I had the kitchen all to myself--though to give full credit to David, he cranked out homemade linguine noodles when the game was over. 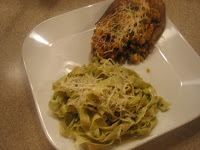 A good smattering of Pecorino Romano on the pasta is a nice finish. As an aside, does anyone have a good recipe for wasabi aioli? The Love, Loss cast went out after the show on Saturday to Ginger, a sort of Asian-fusion restaurant around the corner from the theatre. I don't love all their food, but they have fabulous appetizers. The pommes frites with wasabi aioli are to die for. The following recipe is the compromise for what I had originally intended to make. Lidia Bastianich's recipe contains pistachios rather than walnuts, but the local grocery store was out of pistachios. Seriously? stuffed eggplant in the background is AH-MAZE-ING. Play with the seasoning on this. I wanted a little zip and added dried peperoncini, but they're not necessary. I added a little more garlic to the original recipe because I thought it didn't have enough oomph; pare back to eight cloves if you're a little more tentative with your garlic. This recipe makes quite a thick paste; once you've finished cooking the pasta to go with it--I recommend either linguine or spaghetti--reserve a cup of the pasta cooking water to thin the sauce to the desired consistency. ﻿﻿All all ingredients except for the olive oil and cooking water to the bowl of a food processor. Pulse the mixture until it is a very thick paste, then drizzle the olive oil in tablespoonful by tablespoonful. As noted above, this will make quite a thick paste that you will need to thin with either pasta cooking water or even chicken stock. Isn't that green just gorgeous? This makes lots of pesto, enough for about two pounds of pasta. 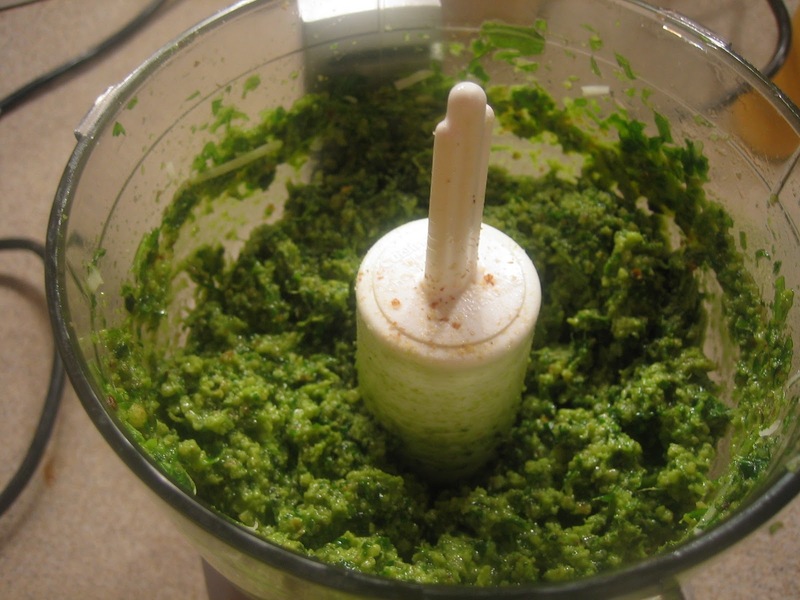 The leftover pesto can be stored in the refrigerator or frozen. I like the blend here, especially since the doctor says I should eat more walnuts! Such a vibrant green a telltale sign of freshness. This does inspire me to want to make some, having pesto in the fridge is a great condiment to have on hand, so your large recipe here is a welcome sight. I actually use walnuts instead of pine nuts in my pesto! I think they are better than pine nuts. This looks great, I love the addition of peperoncini, that's a fabulous idea! The pistachios in the original recipe sound very interesting - I love using walnuts in place of pignolis in Pesto! Oh how I love pesto! I am, frankly, addicted. Yum. Sounds like a great recipe! Such a great pasta sauce! It must be even more fabulous with homemade linguine...YUM! This is fabulous and I love that you added the peperoncini for the added spicy kick with the extra garlic. Homemade linguini sounds like it was easy to just whip up. How did he do that? @Suzi, I will post David's basic pasta recipe one of these days--he makes it look really easy and it takes him no time whatsoever. We use a hand-cranked Italian pasta maker. This is impressive. I love the walnut idea. This looks delicious! I understand how things can get crazy on the weekend! I remember when I worked that it seemed the weekend was for catching up....which was an exercise in frustration! When I started working for my husband I thought I would have more free time because of the flexible schedule. But after sometime I realized I have no weekends for which I always looked forward. Playing around with the ingredients in the kitchen gives me the pleasure in cooking. loved it that you used walnuts instead of pine nuts. Oh yes, I definitely know what you mean about the weekends! I feel that way right now. This pesto looks great, I've never tried it with walnuts! I have been lucky for a long time for not working on weekends. I simply don't enjoy it as weekends are with all the house work, washing clothes, the cleaning here and there plus maintaining my garden. Just like you, when I get the time, its about cooking and venturing into new recipes. I like this simple recipe and this will be great when time is a factor esp after a busy day's work. I am all in for this recipe and am going to give a try soon, that is after buying the ingredients firstly. Thanks for sharing. I right with you on "where the heck did the weekend go?"!!!!!!!!! I would add 10 garlics (love them so much). I have used most any nuts in pesto from almonds to pecans, but I enjoy the traditional pine nuts the most. Cudos to David too on those great looking noodles. Yes, I love GREEN. 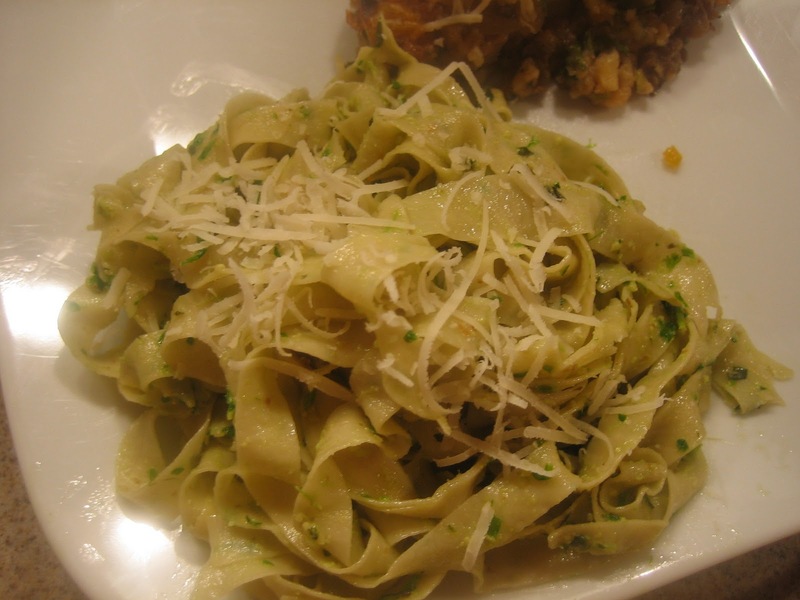 The pasta looks truly delicious with grated Pecorino Romano. I can just imagine you shutting the kitchen door and enjoying every minute of time to yourself - makes it all seem even more precious when you're rocking around! Cheers to going green this way and many more "me" kitchen time! Wow fresh linguini, now that's something!I'm all for more garlic and this pesto looks absolutely delicious!! I cannot WAIT for that stuffed eggplant recipe! It may have surpassed squash as my favorite addiction this winter. Green is most welcome now. After a few days busyness - I would say this was just what you needed to soothe your weary soul. Ooooh! Nice use of free time :) This pesto is brilliant! Yum! I'm loving this take on the pesto! i love fresh pesto!! yum! I must applaud you because you are one busy lady and you still manage to pull incredible meals together. I have to cook something from this cookbook... I have no excuse because this meal looks really wonderful. That pasta and pesto with the stuffed eggplant looks delicious! This pesto is definitely a recipe to keep up my sleeve. I love pesto. I like to change up the nuts in it for sure, this one looks like a keeper! I think on the day when I need some relax time, delicious pasta is definitely comforting, like yours! Looks so good. I'll get powered up with your pasta. I hope you did too! What a couple! Truly a match made in heaven - David with his linguini and your amazing pesto. I think walnut is even better than pistaccio! Have a great weekend!